In the aftermath of the 2017 Charlottesville rally many in the far-right blogosphere have been critical of the Nationalist Front and in particular LOS president Michael Hill’s decision to wed ostensibly Christian “Southern Nationalism,” as the League defines its brand of white separatism, to Folkish religions like Wotanism, atheists and neo-Nazis of the Nationalist Front. In the spring of 2017, The League became a partner organization in The Nationalist Front. This was a loose, unofficial alliance between us, The Traditional Workers Party (TWP), the National Socialist Movement (NSM), and Vanguard America. As of today, The League will no longer be a part of The Nationalist Front. Nor will we be allying ourselves at present, even informally, with any other organization(s). Over the past year and a half, our operational planning and execution have been nothing less than superb (with one exception — Rome, GA in April 2018, which was solely my fault and not our Chief of Operations). As examples of our success, I point to Charlottesville, Pikeville, New Orleans, Shelbyville, Knoxville, and Tallahassee. We believe we have nothing to again [sic] from continuing in The Nationalist Front or any other alliance at the present time. We are, after all, the largest and best organized nationalist organization. We will be doing things our own way, on our own time table, and with our own men and women (plus some specially invited guests from time to time). We will be making an official announcement soon regarding League membership and concurrent membership in other similar organizations. Hill has spent considerable energy over the past few years attempting to quell dissent among his ranks. A classic example of mission creep, Hill’s vision for the League has shifted from “advocating for the survival, well-being, and independence of the southern people” in 2014 to include brawling with antifa alongside white nationalists and neo-Nazi skinheads in 2017 and 2018. An attendant rise in debate has begun among the ranks of the League as many members have come to resent the legal headaches stemming from the group’s participation in the disastrous Unite the Right rally and continued media exposure on its association with “White Nationalism 1.0” — a euphemism for white nationalist activists in the late 1990s and early 2000s typified by the all-encompassing racism, antisemitism and vicious infighting of message boards like VNN and Stormfront.org — and the Nationalist Front. Many saw the League’s adoption of its distinctive uniform of black boots, tactical vests and polos adorned with the “Cushman flag” and khaki cargo pants as indicative of the group’s slide into jackbooted neo-Nazi aesthetics best left in the past. The League was highly visible leading the Nationalist Front’s charge into Emancipation Park during the Unite the Right rally, with both Hill and his chief of staff Michael Tubbs at the head of the fray swinging at counter-protesters as other LOS members battered any in their way with homemade shields. The Nationalist Front was announced in October 2016 as a successor to the abortive Aryan Nationalist Alliance. The joint effort was the brainchild of longtime movement pariah Jeff Schoep, leader of the National Socialist Movement (NSM), and Matthew Heimbach, the disgraced chairman of the now-defunct Traditionalist Worker Party (TWP). Schoep’s claim that the Nationalist Front was nearly 30 groups strong flies in the face of the fact that only four have appeared in public at rallies. The League has long objected to religious pluralism, although certain exceptions have been made, particularly around the question of Folkish religions like Wotanism, a racist, exclusionary distortion and appropriation of Heathenism. Folkish groups generally derive their ideology and quasi-religious doctrine from the Völkisch movements of Germany and Austria prior to the rise of the Nazi party in the 1920s, which incorporated Völkischness into its platform and propaganda, setting them wholly apart and, at times, at odds with mainstream heathens and pagans. Floyd Eric Meadows, a former League member and Army veteran, helped found the League’s first paramilitary venture, “The Indomitables,” in 2014. Due to his close relationship with Tubbs, Hill placed Meadows in charge of training the Indomitables. Meadows since departed the League for the NSM due to squabbles over his Wotanist faith. Further squabbles in the NSM led Meadows to quit that group as well. He has since founded a Folkish compound in Tennessee under the name of Wotan’s Nation (WN). Perhaps Meadows learned something from Hill, the League and the Nationalist Front. The question: Does Wotans Nation allow dual membership? The Answer: No, Wotans Nation does not allow for its members to also be part of other organizations. We have seen firsthand how this negatively impacts the organizations, the membership and causes conflicts and difficulties. We believe that people must focus 100% of their energy, time and effort as well as funding to one primary organization rather than trying to juggle multiple tasks, jobs and functions that comes along with being part of numerous groups. This is unfair to the organizations, to the membership and becomes a drain on several levels to those trying to deal with dual memberships. Robert “Ike Baker” Isaacs is the League’s “chief of operations” referenced in Hill’s directive and commander of the Kentucky branch of the League’s most recent paramilitary outfit, the “Southern Defense Force.” Baker is also an avowed National Socialist and Folkish adherent of the sort that many in the League no longer wish to associate with. 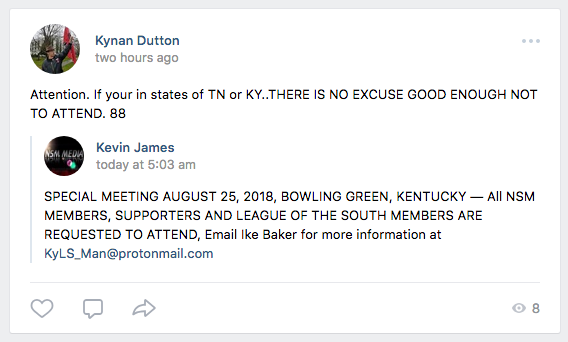 It is unclear whether the League’s departure from the Nationalist Front or Dutton and James’ posts represent a cooling of relations between Hill and one of his closest lieutenants or some attempt at block-recruiting members in the Kentucky and Tennessee areas into the League or another organization. This was the largest League of the South conference that I have personally attended, but I came away from it convinced that we need to change the way we have been doing things. We’ve had the wrong priorities. We’ve been going about this in the wrong way. These criticisms are not unexpected from Griffin, the White Nationalist movement’s oracle-in-hindsight par excellence, though they are notable for their rank hypocrisy. Griffin used his Occidental Dissent blog, writing as Hunter Wallace, to amplify Hill’s strategy in several posts in the lead-up to, and aftermath of, Unite the Right. Throughout 2016 and 2017 Griffin loudly touted Hill’s strategy of street activism and hosted a Facebook group called “The Proud Goys,” where he coordinated attendance at the May 2017 New Orleans Lee Circle rally and helped individuals find transportation to Unite the Right. There is a different aesthetic, energy level and feel at Hard Right events. These people are hardened White Nationalists, Southern Nationalists and National Socialists. They are not gamers, meme makers, identitarians, Kekistanis, Trumpists, civic nationalist LARPers and Patriots, irony bros or other people barely removed from conservatism. Although Griffin spent much of his early career decrying groups seeking to promote their ideologies by loudly marching in the streets adorned in far-right iconography, he was willingly swept up in the far-right’s enthusiasm for the notoriety generated by the rise of the alt-right, and fervent enough in his excitement to openly question Hill’s hesitancy to adopt the label. Griffin’s turn on the alt-right label is consistent with his long-running habit of prophesying trends that have already come to pass. Elements of the far right have begun to tire of their association with the alt-right and are dumping it en masse. Nothing unified the Alt-Right. There is this grand desire among its supporters to reinstate whites as the dominant demographic in their own countries and reclaim their birthrights, but that’s as deep as it goes. There was Richard Spencer giving talks at colleges about white identity, Jared Taylor talking about freedom of association, the Trad Workers Party giving Nazi salutes in black militia uniforms, Identity Evropa flash flagging people on highways, Nick Fuentes stirring up as much drama as possible, tradthots, constant infighting on Twitter and Gab, infiltration and the abandonment of major figures to the bloodthirsty courts. Griffin’s ire with the alt-right as a brand likely stems from being added to a civil suit for his involvement in the planning and coordination of the Unite the Right rally. 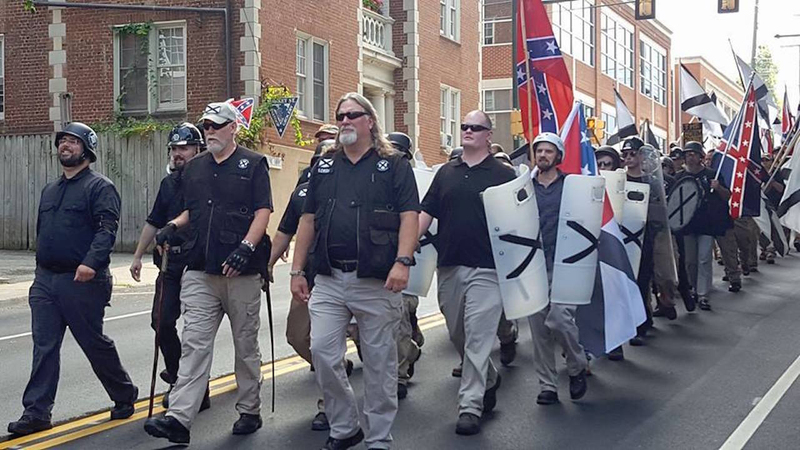 While many in the League groused about the group’s participation in the Nationalist Front prior to Unite the Right, that event and a slew of follow-up demonstrations strained their faith in Hill’s leadership. The final straw appears to have been the League’s appearance in Newnan, Georgia, in May 2018 with Schoep’s NSM. 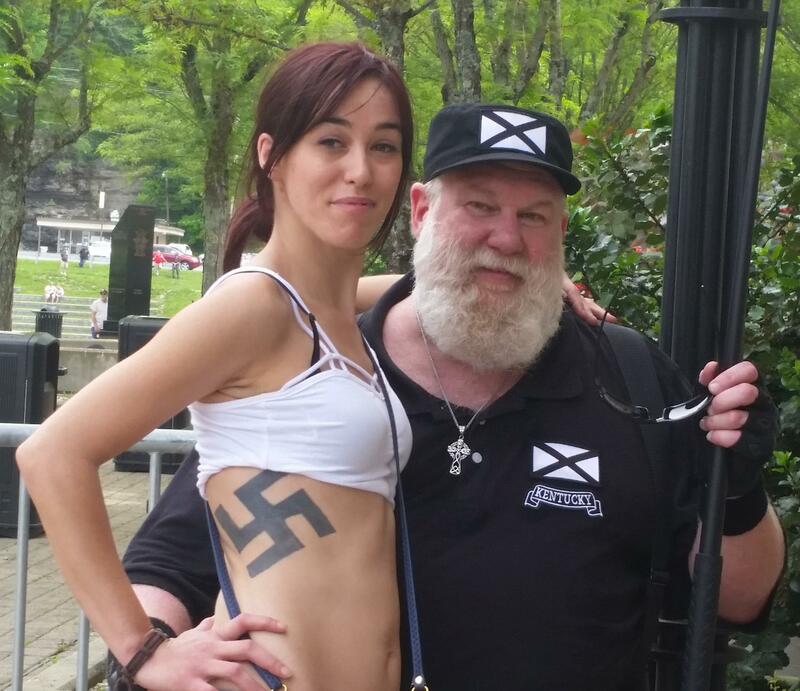 Groups like Identity Dixie, a neo-Confederate offshoot of the White Nationalist blog The Right Stuff, recently hosted a vetted meetup in Asheville, North Carolina. Griffin and Cushman both spoke at the group’s January 2017 meetup in the Atlanta area. Identity Dixie is focused on building a dedicated core of white nationalist activists in the South through online content creation. The group is composed of former League members like Cushman and individuals with neo-Confederate leanings who are leery of Hill’s penchant for violence. Though the formal separation of the League of the South from the Nationalist Front likely spells the end of that coalition, it does not spell certain doom for the Nationalist Front’s constituent organizations. What it does represent is a hardening of relations between a cadre of violent far-right groups that prior to the Unite the Right rally saw themselves as ascendant. As for the League, Brad Griffin’s sniping at Hill represents a continuation of a trend that has been running for several years. As Hill’s grip on his organization has slackened and Griffin’s attention has once again strayed, active contingents have begun to coalesce in Arkansas, Tennessee and Kentucky. What remains to be seen is whether those states will themselves remain loyal to Hill or if past trends will hold and those groups will soon distance themselves and eye less damaging affiliations like those offered by Identity Dixie.